OMG! 20 years ago I was looking at condos and marvelling at the lack of any lateral stiffness. Now they're watering the concrete! It'll be a race to what destroys the building first - time or an earthquake. Yuck. 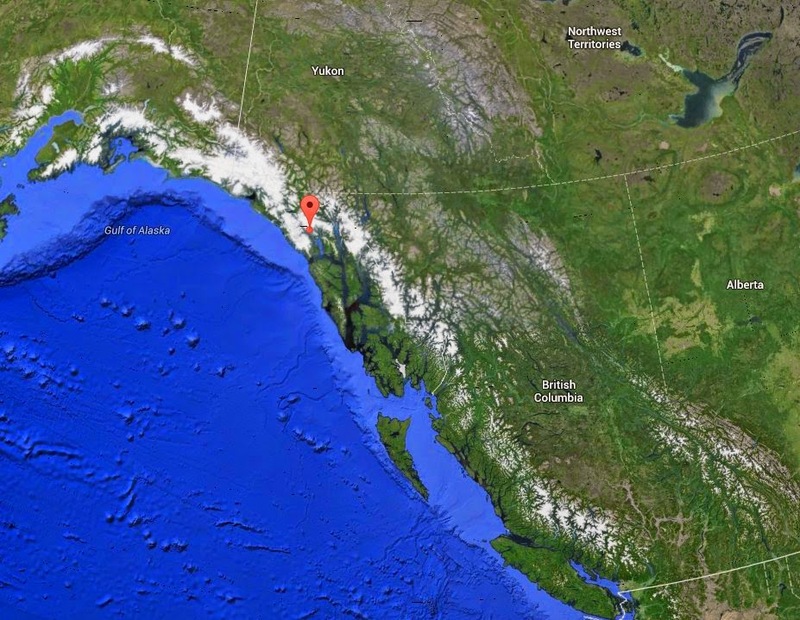 Right at the tail of Alaska. This was registered as deep, and quite inward. Little chance of a tsunami, but they pulled the big horn anyway. This is a very clean but highly curved subduction zone. An 8 is small beer to the giant scratch on the Earth, and it must pull regular M9+'s to keep its clean lines. When we see such an earthquake, then it is time to clear the beach. I'm going to Maui soon, and I will not let go of my shoes! Update: This is when it hit Ontario. Most of the other plots are solid black. I really think this will rattle up some OK earthquakes. 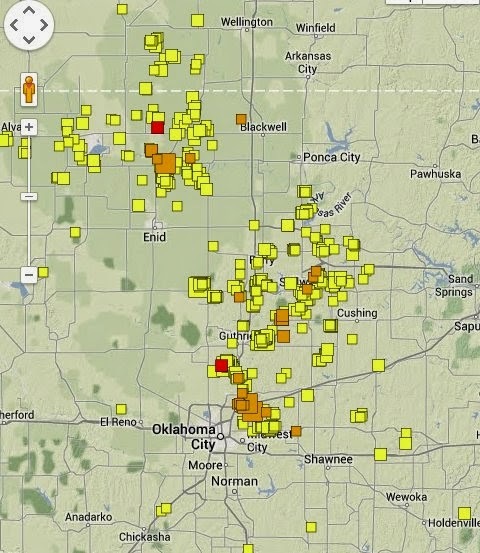 Lots of earthquakes recently and several more today. I'm disappointed that the recent M4.3 does not have a fault-plane solution. Judging from the weak ground motions, I think this is another one of those tension 'back-slip' earthquakes, responding to the main mechanism. Overall, the main mechanism responds to the high horizontal stress by contracting, and this allows the back-slip. The news articles indicate that everybody is being very Spartan about all the earthquakes, since they all work for oil companies. They all make a big deal about the fact that injection has gone on for 18 years. The news article goes on about how the deep space may be saturated and building pressure. Hogs Wallow! This is all about the mix of junk going down the holes. Azle stopped the earthquakes dead by a secret back-room deal that eliminated the frack waste. I make no predictions, but we'll see the same slow build-up. The whole place will light up when we finally get a real thrust earthquake, but that could be forever, or never. Beautiful weekend, hardly anybody went up, and the traffic was light on the way back. I found that, before, when the gas price went way up, nobody went up just for the weekend. I am going to officially declare a light mosquito season. For us, they are almost totally absent. Normally, we get clouds of them in the evening, and now barely a hum. Horseflies and deerflies are up a bit right now. Nothing really heavy yet. Normally we are whapping them at the dock and feeding the fish. The puppy has really learned to chomp them. I've been fishing a few times for deep fish in the lake, but I've only caught a few rock bass. We saw some big bass nests in the the shallow bay, but the bass have recently gone, and I hope they were successful. Next week is bass season, and then I go shallow with casting. The two peregrines in the nest are happy, and two siblings from last year are hanging around screaming all the time, perhaps hoping for a treat from Mama. Wonderful place as long as you stay out of the city. Big wildcat city workers strike while we were there, but we never went downtown. Get set for another sticky summer as the new gov't tries to whittle the infinite mass of subsidies. I'm certainly glad Ontario voted for money on trees! 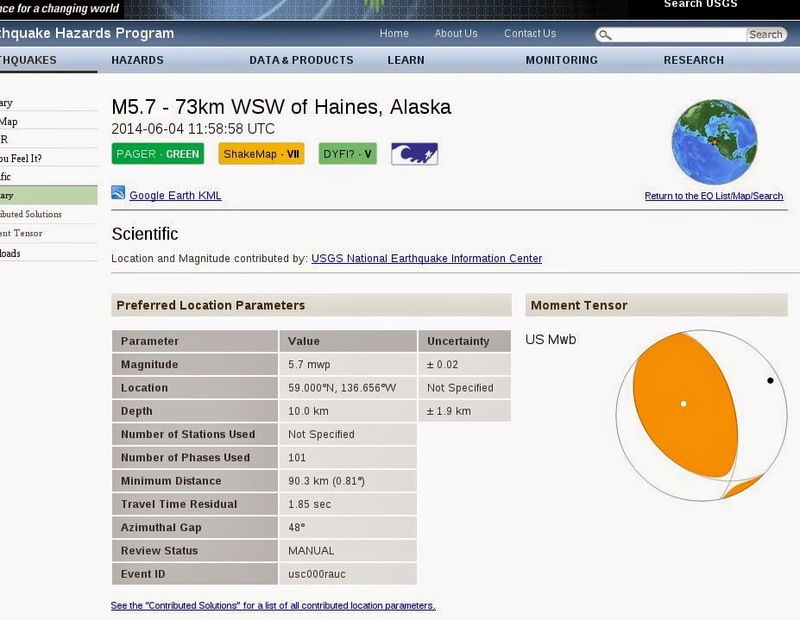 Two M4+ earthquakes gave enough displacement to thoroughly rattle the whole system. This is the beauty of non-linear discrete elements. You can get to a state where the butterfly wings really do directly cause a storm. Of course, therefore, by definition, you can have no idea of what will happen in the future. You are in the firm grip of the Chaos Gods. Ok, I just learned that if you have an LTE phone, it won't work at the cottage without setting the apn for 3g and phony 4g. I've been thumping my head against that for a long time. ps. I just learned we got a big corporate trip to Hawaii. Woo woo! I'm going to be Denis to Margaret. Did he ever talk? We've had a bunch of earthquakes on the big thrust fault, including an M4.3 with foreshock and aftershocks. If we get another M4+ in that area, my next headline with read "Thrust fault starts to unzipper". We have here an intensely locked high-angle reverse fault. All those other shear earthquakes have piled on the stress, so it's probably twice ambient, which is saying something, since we know the predominant horizontal stress is NE and quite high. Normally, we would expect a thrust fault to react to this stress, but what if the fault is very rough and just doesn't want to go? Then it cracks on another fault plane. With a high horizontal stress, we can go around the stereonet and find planes with all types of stresses, from shear to tension. You can see this if you put a rock specimen in a uniaxial testing machine. Vertical cracks appear before all the shear cracks line up and it fails in shear. That is why we have this weird extension, as a preliminary stage to a major thrust. It's on a plane perpendicular to the main fault. This failures are good for the mechanism, as the tension cracks allow more fluid to flow. I'll bet the pumpers right now are thanking their lucky stars. Much more fluid is going in. I am 6 months out from my initial predictions due to the tremendous fractal roughness of the fault. 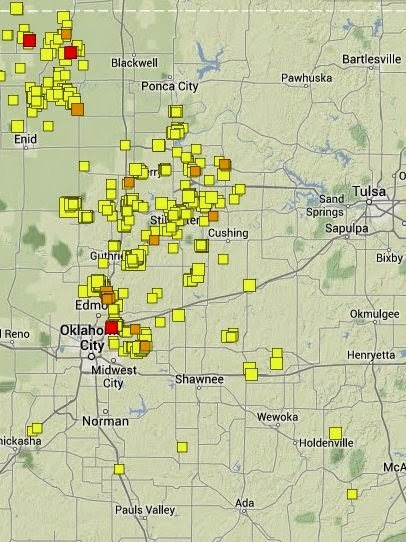 We might get more of these extension earthquakes. On a seismological note, an extension earthquake has the hammer driving down into the ground. On all earthquakes, there is always one side more rigid than the other, usually the footwall. The other side has its main slip in some direction, and is called directivity with strong ground motion studies. I call it the 'hammer'. 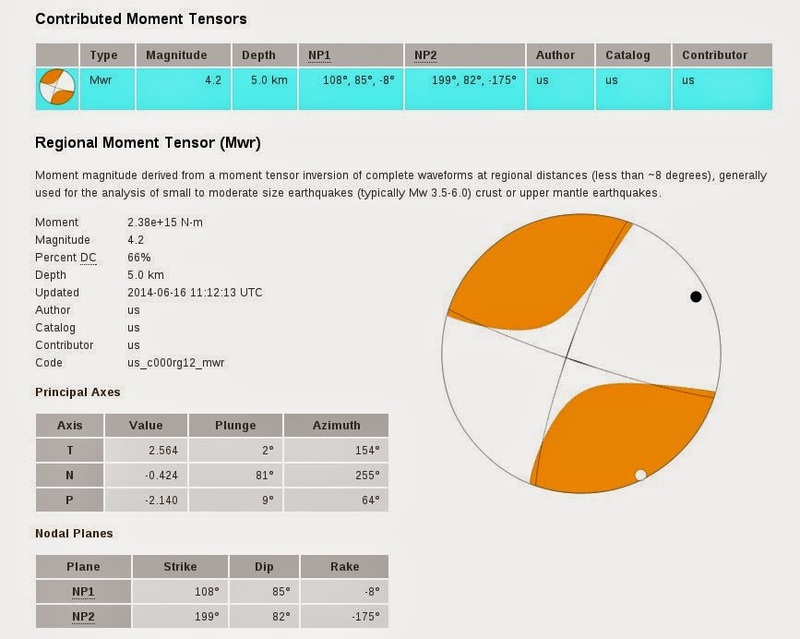 That little M3.5 foreshock was a thrust with the hammer upwards on the hanging wall. Thus, people in certain areas had very strong shaking. 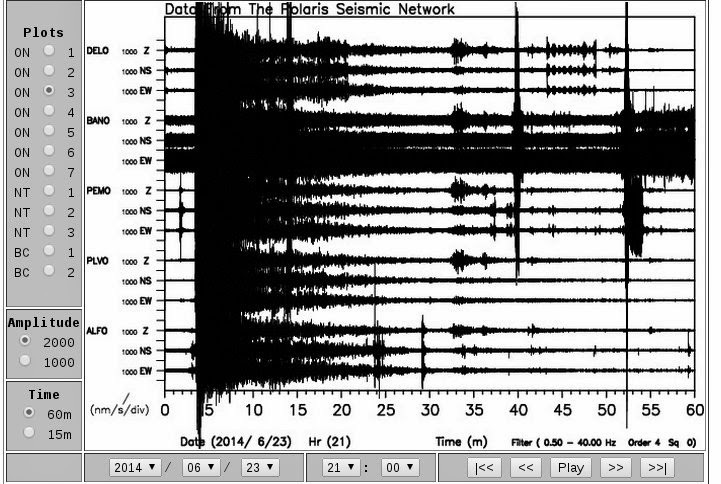 The M4.3 was hammer down, and the distant SOSN seismometers picked it up strongly, and the only MM - V was a 100 km away. That's due to 'Mantle Bounce', and it happens for a lot of earthquakes. Update: M4.1 tension earthquake. Probably very low ground motion. Uppity. OK goes nuts! Lots of earthquakes and I'm stuck in No with my N7. Oklahoma has been so boring lately, that I am desperate. I first thought they had stopped injecting the good stuff into the main faults. So much money lost .... nah! Now I am convinced that the main thrust fault is putting up a good fight, mainly that it is currently locked. If the thrust doesn't move then the whole mechanism is locked. This happens all the time, and is one reason that you can't extrapolate this kind of stuff. Think of it as a potential landslide which starts to move, with huge tension cracks, and then completely stops. Thus, I like the larger earthquakes on the thrust. They have to be way over M4 to get a focal mechanism, but there may be hints by the felt reports. Usually, there is a confined felt area, and the magnitude is adjusted downward. Update: This produced some reports of an Intensity V, things knocked off shelves, which shows that it is a good thrust fault, with a hammer zone under some houses. Super update: This was a foreshock for an M4.2. Now we're talking, the fault is free! Aaack! The fault plane solution is extension, which is insane. I'm going to have breakfast. Another update: That stupid M4.2 really was extension! Not a speck of ground motion, much less than the previous, and the only Int-V was very far away, on a very soft swamp. Blathering: Bumped up to 4.3 which is normal for normal. Yesterday was rather cool and miserable. We call it a good working day... Today was a nice Father's Day. I found out that those Gulp jars of worms in a liquid really work on the rock bass, and the largemouth bass, even though it isn't bass season yet. Some yahoo introduced Pickerel into the lake on this own, and now I'm trying to catch it, but so far no hope. Book your time for a visit to the Legion, where people are friendly and the beer is cheap. More fun for two weeks. Off the list is the fact that the geology is all wrong, and this will be the biggest Liberal boondoggle the world has ever seen. "It's worth it at any price." And we can only stand and wonder. Dear Mr. Fish, you cannot blame "The Dalton Gang" for this one. It is entirely a Federal disaster. I am sorry, it won't happen again. Is Ontario becoming the new Quebec? Well, Q is trying to change now. Not much chance. Ontario, if it exists under the Liberals, will not become Q, but more like Japan. Endless central planning for photo-ops leads to things like the Niagara Tunnel to Nowhere, and the 'Men are from Mars' thing. We all know every other disaster. We also have giant State-run companies (the old company), and most of the economy run by monopolies, and state-protected banks. That is why we don't have productive investment. Speaking of the old company, I love this article. There's a better one in Automotive News, but you can only get to it once. Seems they hired a bozo engineer, who controlled everything. He designed a flimsy switch and covered it up. Now, I'm not saying I've seen this a million times before, but it is a classical result of a dysfunctional bureaucracy. I've written up some fine local examples. GM used to be a monopoly and that is how it is structured. They now shipped in a whole bunch of new people who say they don't know anything, and fired a lot of scapegoats. At least we retire them. Hot and sunny. Absolutely beautiful with the lake as smooth as glass. We're between bugs right now, the deerflies aren't serious yet, and mos-ies are light. The Peregrins have 2 baby chicks, and Momma buzzes you if you get too close. The lake water level is very high, and we've been stealing driftwood to put on the shore. It all goes away next Spring, which is only fair. It looks ugly to chain it down. So, if I were in the foreshock business, I would say this is really unfolding as it should. The big 7 should be coming soon, and I would say this nails it to 1 in 10. 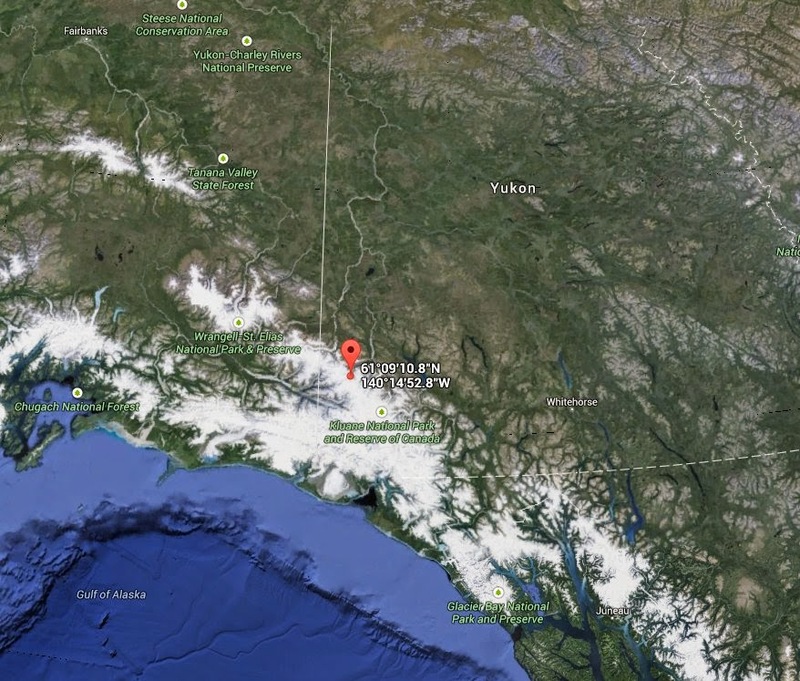 I just realized there is a little place called Whitehorse that seems to be located on swamp. Park your cars away from your chimneys folks. Get your emergency kits together because your power will be off for days should the inevitable come to pass. Now, I know I am absolutely right on the geological time scale, but who knows on the human time scale? Humans want to know 'Are we there yet?'. Nobody can be right on this scale. So, if your are feeling these earthquakes strongly, then get ready as best you can. The standard frame house will protect you, you'll just lose all your bricks. Might be too late to get earthquake insurance but you can try. Enjoy the ride! Update: Seems to be all settled. Forget I said anything. :) We'll roll the dice the next time! I was quite amazed to see this. Having started my interest in the whole injection-earthquake thing, they then cut everything off. They have a nice dammed lake that attracts earthquakes. 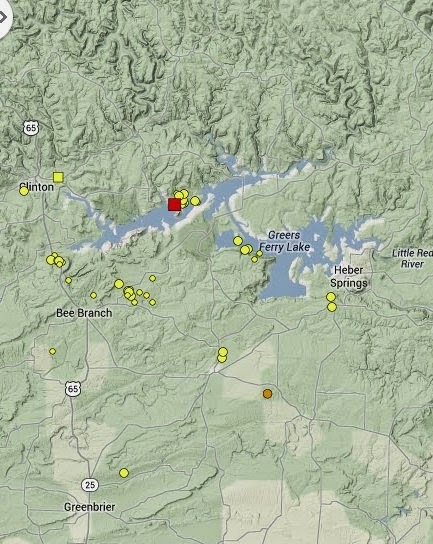 Lots of old earthquakes by the lake. I don't know if they inject there any more. I am confident that the Virginia 6 was triggered by their lake, so I'm happy to have this lake cause earthquakes. The mechanism is very slow, however, without pumping in a lot of crap. Ha, one in twenty chance! But really, this is the earthquake I've been 'predicting' for some time now, based on the sound methodology of the climate scientists. Mainly, a two-point, pencil-thin, linear projection. Ha, don't argue with me that there is no physics here! I've got more physics here than 'them'. The nice thing is that the M7.5 and the M9 won't do a thing to nobody. No tsunami. No real ground motion. Only a cabin with a brick chimney on a swamp may have to worry. The fault-plane solution is messy, as befits an armpit. 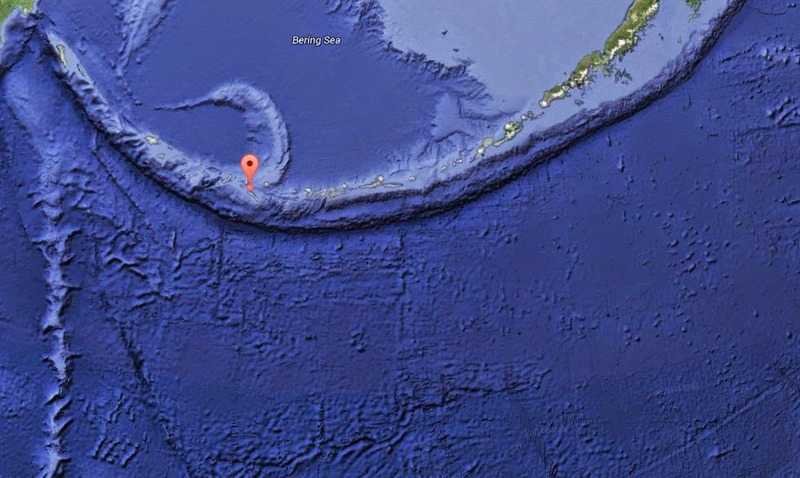 This is where the subduction meets the transform, and who knows what will happen. I suspect that the main shock will be mostly shear. Update: M5.2 nearby, no fault plane solution. I'm generally glad that Pickering is closing down, these few extra years probably don't make much difference. It's just that when they finally close down Chalk River, then Pickering becomes Ontario's Seismic Death Trap. Hopefully, they both close down at the same time. A pano off the deck. The Oak leaves are full, the blackflies are all gone, and the only thing left is the ice-cold water. Mosquitoes are out at night, but one Off lamp keeps them away for now. The clouds haven't arrived yet. ps. Blogger presents it just as a picture, but on g+ you can zoom and pan.